Sean Dyche remains confident his Burnley side can stave off the drop. The Clarets slipped to a 2-0 defeat at Southampton on Saturday, and are one point from safety with eight games remaining. Written off the moment they were promoted, and after failing to win any of their first 10 Premier League games, his players are still alive and kicking ahead of a home double header against North London rivals Spurs and Arsenal. And Dyche said: “I’ve never been not confident. “You’ve got to remember that about three and a half seconds after we got promoted they said we’ve got no chance next year. “But we’re in there fighting. “People keep writing about this struggling Burnley, I don’t know what they’re thinking about, how are we struggling? We’re in the Premier League, people thought we’d have nothing and need snookers at Christmas. 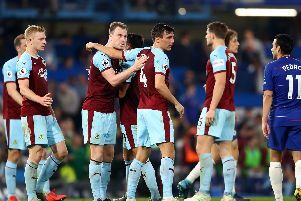 With the international break, the Clarets are not in action until hosting Spurs a week on Sunday, and Dyche and his players will take in a training trip to Spain: “We’ll get a few days away but they’ll be training days, then they’ll get a couple of days next weekend to rest, they will be work days. “We’ve got big games coming up so it’s important that the players are fit and ready as you saw again on Saturday, the energy was outstanding, the will and the belief to effect the game, no matter what.